Masala Bites, one of Mississauga’s premiere Indian restaurants, sits in the middle of Mavis Mall at the corner of Mavis and Eglinton. 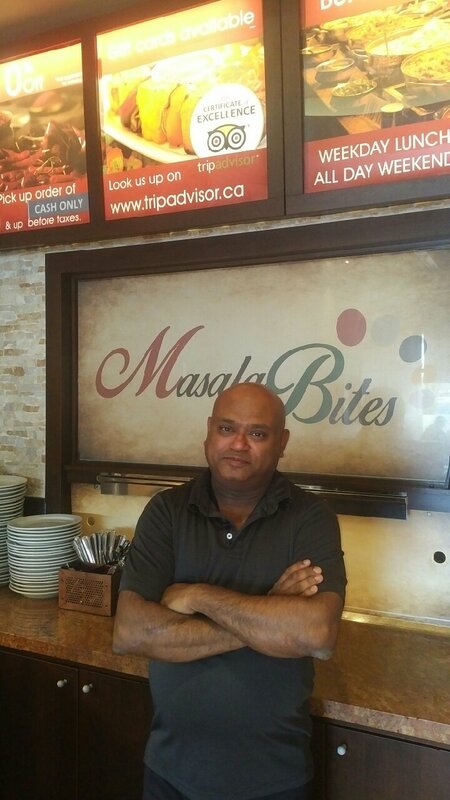 Sujoy Mondal, the owner of Masala Bites, is an accomplished chef, having studied French Cuisine in France before immigrating to Canada. In his earlier days, he worked his way up from chef-du-partie to the director of food and beverage of a Mississauga franchise of the hotel giant, Novotel. His work in the corporate restaurant world, though lucrative, did not capitalize on his creative passion for cooking. Mondal had dreamed of opening his own restaurant by the age of forty so that he could retire and leave a legacy for his children by the age of fifty. He’d also dreamed of cooking the food he’d known best since he was a child. “I have not had formal training for Indian food,” he says. Everything he learned of his own food, he learned from his mother. Mondal’s recipes are unique to his taste and culture, which is one of the reasons he decided to set up shop in Mississauga. I tell Mondal that I’d been one of his first customers since he opened shop four years ago and have seen the restaurant fill its empty seats in a manner of months. He tells me he never expected the level of success he’d experienced with the business but attributes his achievement to treating his staff well, taking downtime from work to rejuvenate, and serving quality food with excellent personal service. He takes time to talk and relate with his patrons, a service which I can attest to. For newcomers to his restaurant, Mondal recommends the shrimp malai curry, a west Bengal curry that uses coconut milk, cashew gravy, cardamom and various spices to create a rich cream sauce that’s mild but infused with flavour. He learned this recipe from the hands of his mother, so you know it’s authentic.